In the late fall, my whole front field appeared as snow with these flowers. Winter lingers in north Erath County, Texas. Grasses remain brown, although buffalo grass emerges through dead grass of the late fall freeze. My paint gelding, Star, has lost weight and his laminitis has remitted completely. New neighbors, the Stroebels, have moved onto the land to the southeast. The husband is an English teacher. The wife is an engineer, originally from eastern Europe. At the first instance, I like them. They purchased the five acres mainly for the new stone house. By my stated goal a few months ago, I have only a month or so before my photographing all flowers on my place comes to an end. I know I have missed some flowers over the last eleven months, but I think I have captured many. Some flowers, like the wine cup, did not unfold last spring so they fell outside my range, but not my thoughts. Two days ago I took this photograph of a butterfly on a cluster of aster-looking flowers. These flowers were so abundant in the front field that it appeared as snow. 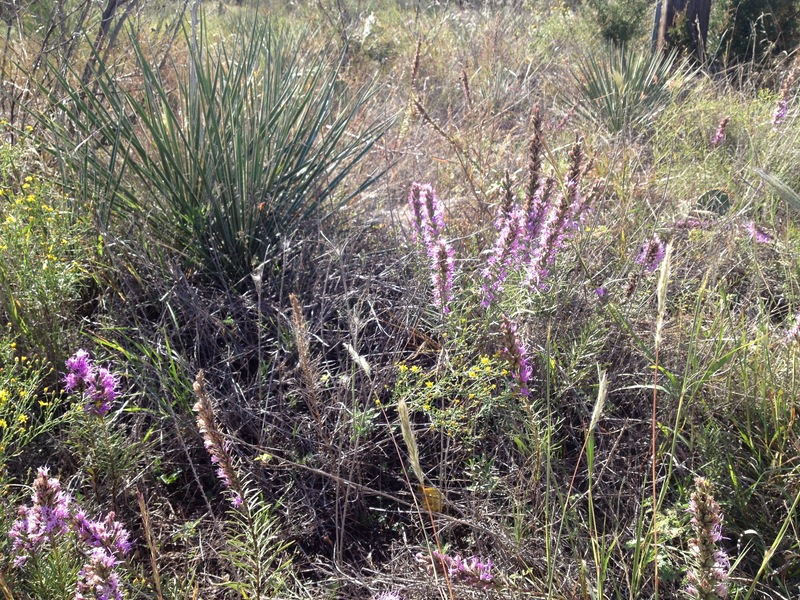 Here are liatris blossoms in a park two miles from where I teach in Abilene, Texas. This photo was taken about a month ago. While in Santa Fe this summer, I found Don Quixote’s image in the clouds. Meanwhile, back at the ranchito, prior to a rain, the sage bloomed on the terrace. I have also included four more blossoms on the ranchito. For the last three days, it has rained and even tumbleweed has blossomed! This summer our region — Ft. Worth to Abilene — has had only eight or so days at 100 degrees. Last summer by this time twenty-seven days had been at 100 degrees, ending at about seventy days at 100 in the summer of 2011. Grasses are greener, no wildfires have erupted. My pond has shore-line reeds and fish jumping, blue herons abound and several new sprouts of willow emerge along the banks. Of course, there are mosquitoes, crickets and grasshoppers. The West Nile virus has killed two people in Dallas, about three counties away. I draw no conclusions about why the weather is cooler this summer, it just is. I understand changing weather patterns, but why the patterns are altered this summer, I draw no conclusions; they just are that way. On the Lady Bird Johnson Wildflower Center website, botanists answer questions from the laity — you, me and other interested observers of things botanical. Wild Bill of Wild Ramblings asked me where the common names, Fogfruit and Frogfruit, emanated. For the moment, Wild Bill — and others –, this is the best answer I found. Yet, the question of origin requires more research. The Oxford English Dictionary (OED) is a good first start. The OED cites: ‘1866 J. Lindley & T. Moore Treasury Bot., Fog-fruit, an American name for Lippia nodiflora.’ I will have to go to the university library to find The Treasury of Botany, but at least I have a title to search. Nineteenth-century newspapers and periodicals probably have notations about common names, so I better dust off my microfilm reader at the office. Oh, Bill, why did you have to ask that question? Common names are curious things. While no one would bat an eye about a paper dissecting some arcane point of minutiae regarding Polygonum orientale, it’s difficult to imagine a crotchety old botanist standing before his peers at a professional conference and delivering a serious exposition on “Kiss-me-over-the-garden-gate.” Where botanical names are all about science and rules, common names are about art and whimsy. Botanical names are about the sharing of information; common names are about conversation and pleasant communication. Botanical names are neat and orderly, law-abiding citizens; common names are messy, free-wheeling, teenaged scofflaws. All of that is a way of saying that “frogfruit” and “fogfruit” are like the old chewing gum ads – they’re “two… two… two mints in one!” OK, Phyla nodiflora is not a mint, it’s in the Verbena family, but both common names are commonly applied to that species and several others related to it. In fact, fogfruit probably even predates frogfruit as a common name by about 100 years (early 1800’s for fogfruit vs. early 1900’s for frogfruit). Most likely, frogfruit arose as a common name from a mispronunciation or misspelling of fogfruit. I have in my mind the scene of a copy editor looking at “fogfruit” and saying, “That can’t be right! What the heck is a fogfruit? It must be, oh, I don’t know, maybe frogfruit! Yep, that must be it. Frogfruit makes a lot more sense! Set the type, boys!” Even today, if you do a Google search for each common name, you’ll get more “hits” for fogfruit than you will for frogfruit. Neither common name makes much sense to me and I’m still looking for a good (non-fanciful) explanation for the origin of either one. My personal preference is for the common name, Turkey-tangle, but that’s another issue altogether. 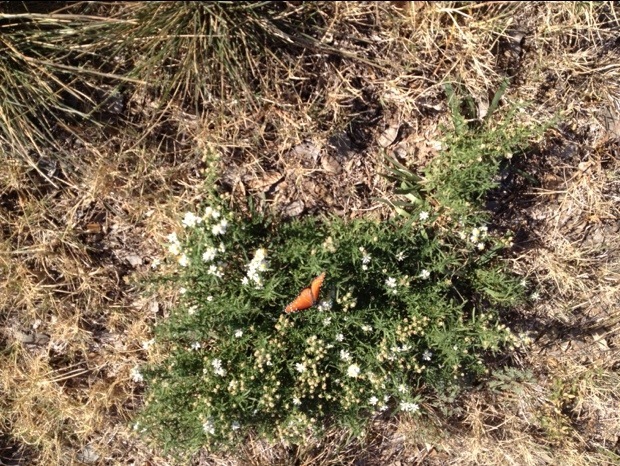 — Joe Marcus of Lady Bird Wildflower Center, The University of Texas at Austin. I open the valve on the far-field water trough and I nonchalantly look around the ground, thinking, There are no new wildflowers about. I am wrong. 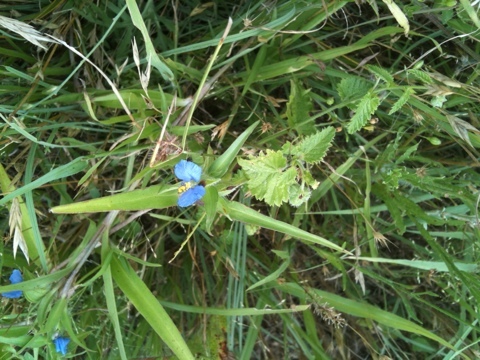 I see three new wild flowers. Well, I declare, my Aunt Lennie used to say. Mandala56 posted this comment: ‘What’s that blue one called? When I was a kid we called it “elephant’s ears”.’ I replied that I did not know — yet. I was in the field when I published the post. I am wrong Three new wild flowers come to my view. At 8:30 this morning, I walked and drove to the far field. Smiling at wild mustang grapevines that yield monarch butterflies along the fence row, I hiked with camera in the grove along Salt Creek. The creek runs water despite the lack of rain for over a month. Squall lines last evening bypassed the ranchito, dumping hail and rain in Fort Worth, sixty-seven miles away to the east and in Cisco, forty-five miles to the west. Wine Cup clearing, as I now call it, bears Wine Cups this Spring. I saw none last year. In the photograph above, the Wine Cups are on the right side of the clearing. They have cool shade from the oak and elm and the creek runs nearby that brings the ambient temperature down a few degrees. Names have been given, I am sure, to places on the ranchito before I came, but they have not been passed down. (There has been only one owner previous to me besides the Venable family that settled larger sections of land in the surrounds.) I give a name first by location: near field, far field, arena pasture, barn pasture, etc., but then when an object or landform becomes prominent, like Pecan Tree or Wine Cup, I name the space, giving it animation and fixing the impression. I have no crew to direct into the pastures, but when I refer to The Grove or Pecan Tree Pasture, friends and family know where that is, associating flora and fauna with location, and ambiguity disappears. Two-years ago, I discovered one or two Wine Cups in the grove, up from the creek, in a private place for this blossom. 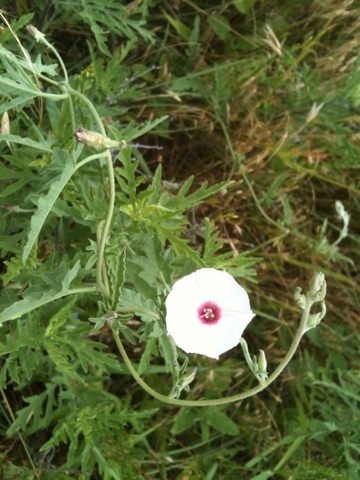 Today, eight blossoms of Wine Cup or Poppy Mallow emerged from the same location. Eight Wine Cups are not a bell weather of climate change, but rather, I suspect, a change due to fallowing, allowing the flowers to replenish. Green grass and tall trees abound about the Wine Cup’s private place. I find no Wine Cups at other locations on the ranchito although I continue to search. I find Trailing krameria or Prairie sandbur in only two places on the ranchito, both on the knoll where the house sits. 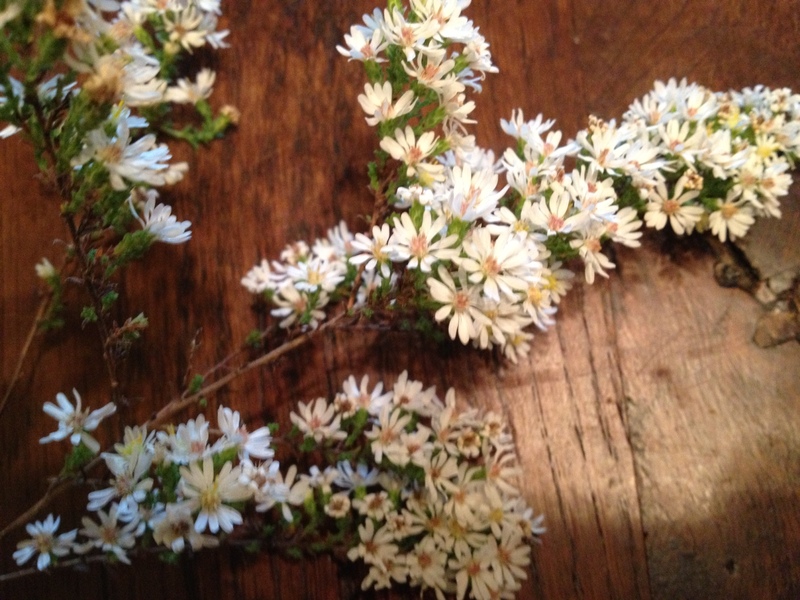 This is a delicate plant and can be missed and mowed under if one is not careful. It lies along the fence line between the house and front pasture and, secondly, has emerged on a terrace to the southeast. I find archeological evidence of hearth and tool making about the ranchito and I wonder if earlier inhabitants or migrants saw this plant. I presume so and know it must have some medicinal properties? The stems of Skeleton Plant are rigid, attached at obtuse angles, like a skeletal frame. The flower stalk and blossom are tall, some two feet. These plants are more prolific this year than two years ago. Here is a larger picture of the Purple Dandelion with yucca blossoms. I cultivate neither. Both emerge wild. In the far field I have Bull Nettle. It has medicinal properties, but is quite painful to be brushed against. As a boy, I got a painful lesson in ‘trying’ to pick its blossoms. I have a collector in Wisconsin to whom I will send a few with warning labels this Spring. No. 31 is Common Yarrow. The pastures are browning here and towards San Angelo and Mexico I am told by ranchers more desert appears. Grass fires have been erupting this last week between here and Abilene. Yet, the diversity of nature here on these 53 acres of my ranchito shows both browning pastures and a creek that runs water with moss growing on its banks. Brown and green, primary colors of nature, intermingle and birds continue to sing despite the fear I have that a climate shift has come and the green will dwindle until next year’s Spring rains. I may be right; I may be wrong. As the ancients said, We shall see what we shall see. When possible, I use a large keyboard, not the small letter touchpad of iPhone. Who can possibly compose substantially on an iPhone? My hands are large, like a teamster’s. Here is my keyboard (QWERTY) I have pressed and pressed posts since 2005. I ratchet out fifty-words a minute when inspired or copying. Nonetheless, I still have a typewriter although it is in the barn. It is an Olivetti portable I purchased in Amarillo, Texas, back in the 1970s. I look at Office Depot and Staples most times I shop and I still see typewriter ribbons stocked. How long will Office Depot stock typewriter ribbons? Probably not much longer. I like the clack, clack of the keys hitting paper, although it has been twelve years since I used the Olivetti. Although I eschew Wikipedia, the typewriter ribbons link above is quite informative. Here I have more photographs of flowers that blossom on Flying Hat Ranchito, an ongoing project of mine for 2012-2013. The yucca stalks that blossom flowers have been erect for two weeks, but only today have I seen blossoms. Although we have had rains that nourished the first eruptions of grasses and plants, for almost three weeks now we have been bereft of moisture. The pastures are already browning and it isn’t even May. Most likely, the failure of the yucca stalks to bear flowers emanates from our dry spell — we shan’t call it a drought, just yet. Horse mint is neither as prolific nor robust as it was two years ago. Again, we lack additional rains to bring the horse mint to full fruition. But some hearty plants, nonetheless, have sprouted. To my west, on the Dooley place, a whole field of Texas pricklypoppy has erupted. I have a few poppies on Flying Hat Ranchito, and No. 22 is an example. Yellow flowers predominate this time of year on my ranchito, especially the Cut-Leaf Daisy. But No. 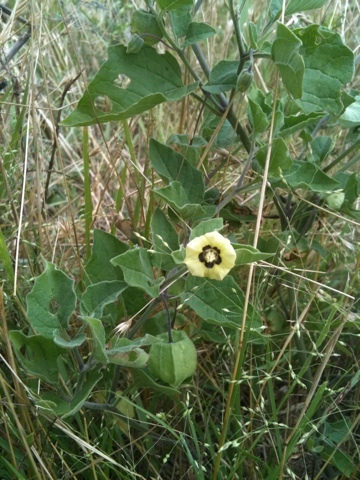 23, a yellow flower, I have not identified. I first had it down as a Black-Eyed Susan, but now I am not so sure. Indian Blankets are rather sparse this Spring, not fully developed as two years ago. Nonetheless, here is No. 24, a photograph I took this morning over in the far field. I have brilliant photos of the Indian Blanket from year’s past, but this No. 24 is from my project of photographing wild flowers for 2012-2013. This morning as I drove along the southern boundary of the far field where the large pecan tree lives, I came across a roost of Monarch butterflies among the Mustang grapevines and mesquite. I estimate twenty to thirty Monarchs abounded, played and flew about the fence line, large butterflies they were. ‘Tis not a promise, but I may go over in the morning and photograph the area. And, I shall come back to the house and type out my spiel on a QWERTY keyboard, not an iPhone. Furthermore, my Olivetti portable needs to be resettled in my office and not remain in the barn, do you not agree?